'Architrave' is the name given to a decorative moulding, usually made of wood, that surrounds a doorway. Traditionally architraves are used to conceal the the gap between a doorframe and the edge of a wall. It’s important to us that you get the architrave that’s right for your project, be that a board which is delivered quickly, easy to maintain, or in keeping with the style of your property. Like our skirting board ranges, we have four matching ranges to suit these requirements. Although it's not unheard of to have different skirting and architrave, the most common practice in interior design is to have matching skirting boards and architrave. This provides a design consistency throughout a room. 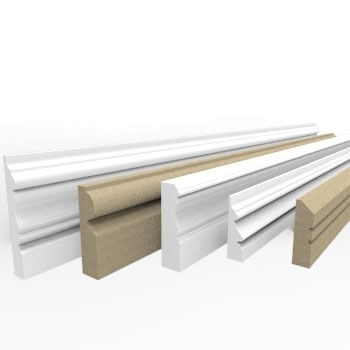 All of our MDF architrave profiles are designed to perfectly match and compliment their skirting board counterparts.